At the top of the sale was this 1934 Yankees team-signed baseball, featuring the signatures of Babe Ruth and Lou Gehrig. It went out at $5,060. 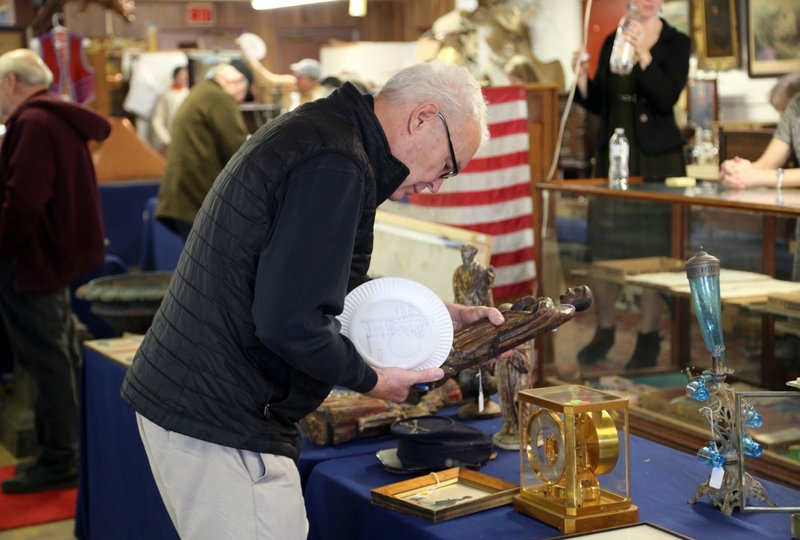 COVENTRY, CONN. – The crowd inside Bruce Ingraham’s auction hall on January 1 was evidence of a 15-year tradition – one that slowly built and now regularly results in a packed house every year. 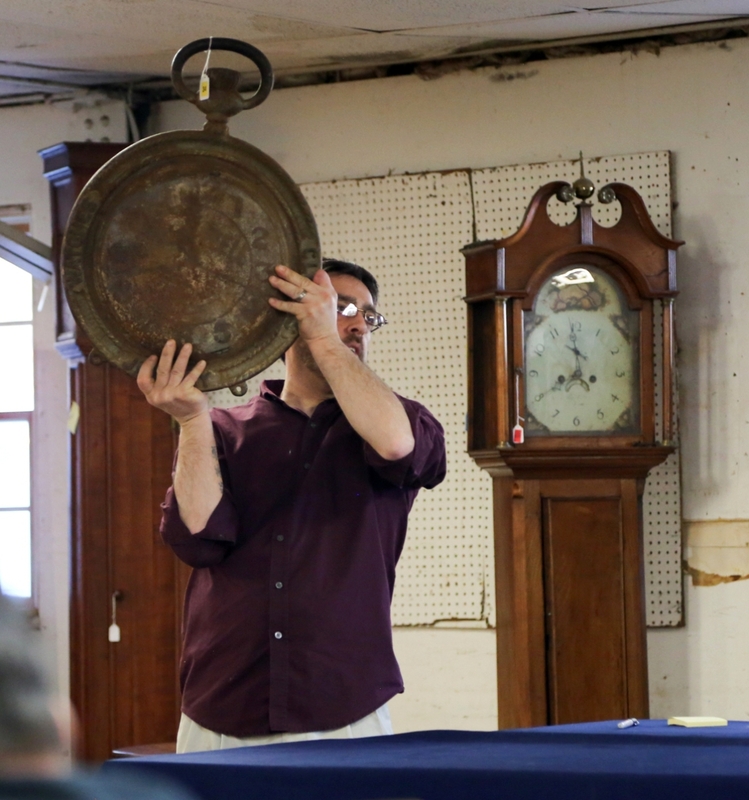 More than 50 people filled the rows of seating to bid on more than 200 lots in Ingraham and Co’s New Year’s sale; bidders included dealers, collectors and those who have made the auction a tradition of their own. 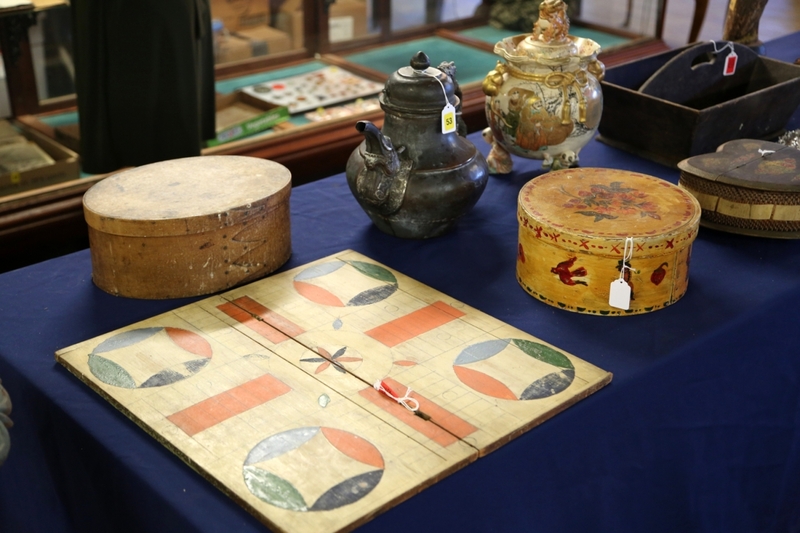 The offerings were varied, including an assortment of American furniture, tall clocks and candle stands, country-painted furniture, glass bottles, shaker boxes, original paintings, prints, advertising, toys, primitives and treenware, pottery, reliquary carvings, gameboards, signed sports memorabilia, taxidermy, Arts and Crafts furniture and more. One of the draws to an Ingraham sale is the chance to get a good deal. 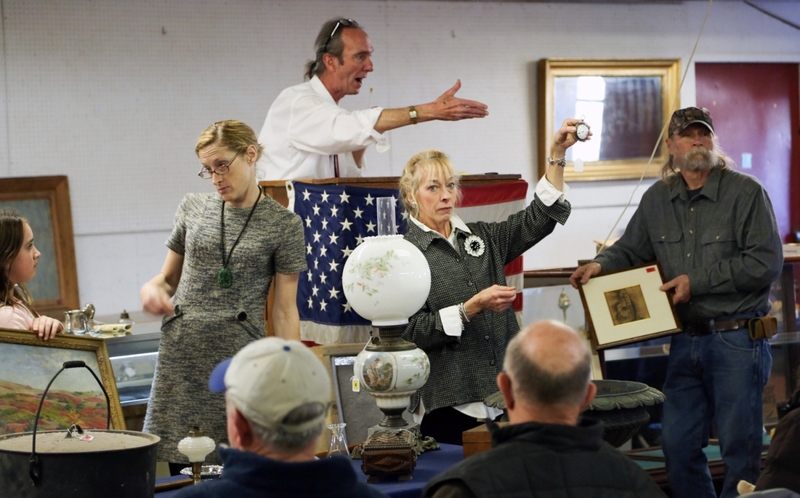 While the auctioneer gets good prices – and plenty of phone bidders – on the better lots, a good portion of the offerings will sell to floor interest alone, making it a valuable, old-fashioned picking ground for knowledgeable buyers. And the sales are enjoyable. Ingraham is a showman, quick with a joke and quicker with the gavel. 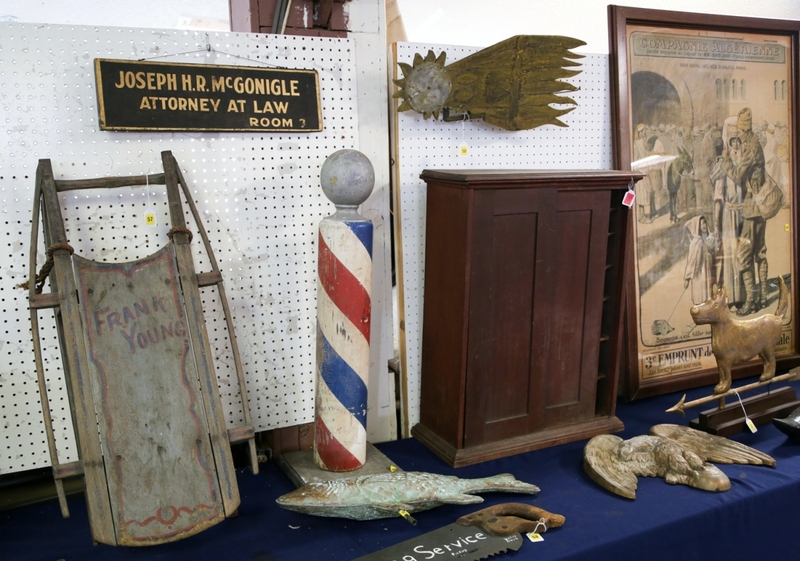 Many of the items in the sale came from Connecticut estates, including approximately ten to 15 consignors, according to Ingraham. 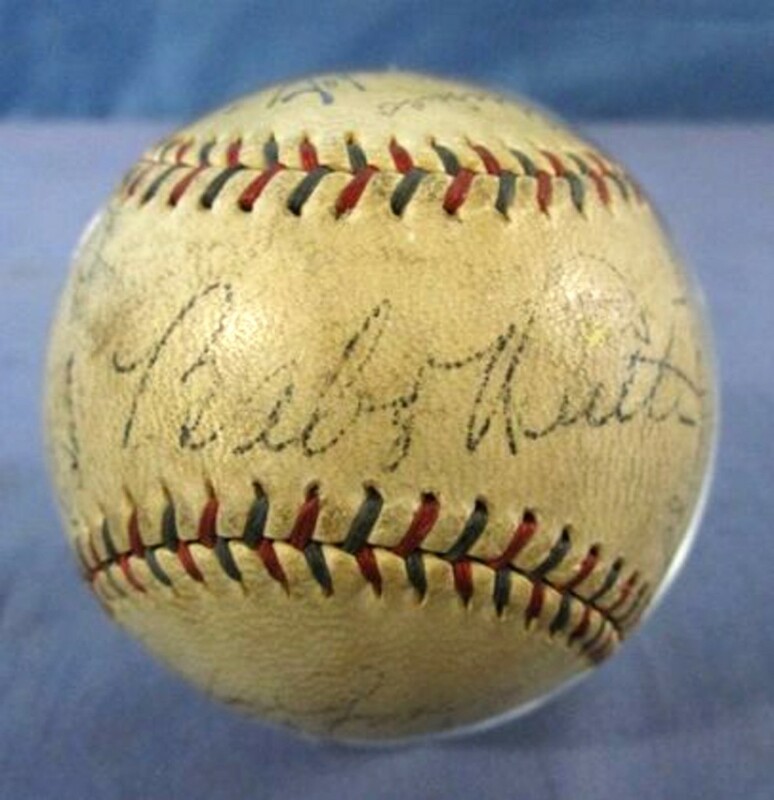 At the top of the auction came a 1934 Yankee’s team-signed baseball featuring the signatures of Babe Ruth and Lou Gehrig, which sold at $5,060. The 1934 season was one of Gehrig’s finest, as he held a number of league-high records, including 49 home runs, 166 RBIs, a .363 batting average, .465 on base percentage and a .706 slugging percentage. The same year, the second to last season of his career, Ruth would hit only 22 home runs but he still managed an on-base percentage of .448. The lot started with a left bid at $4,000 and ultimately sold to a collector over the phone. 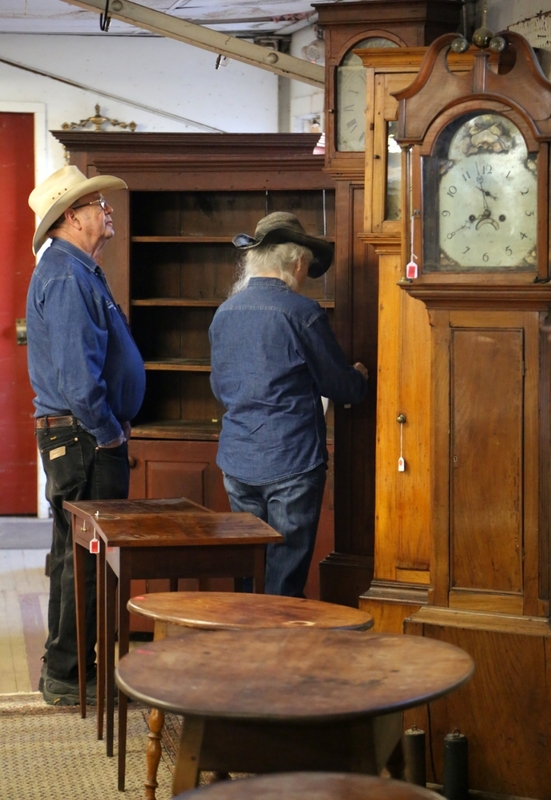 The auction hall was packed January 1. 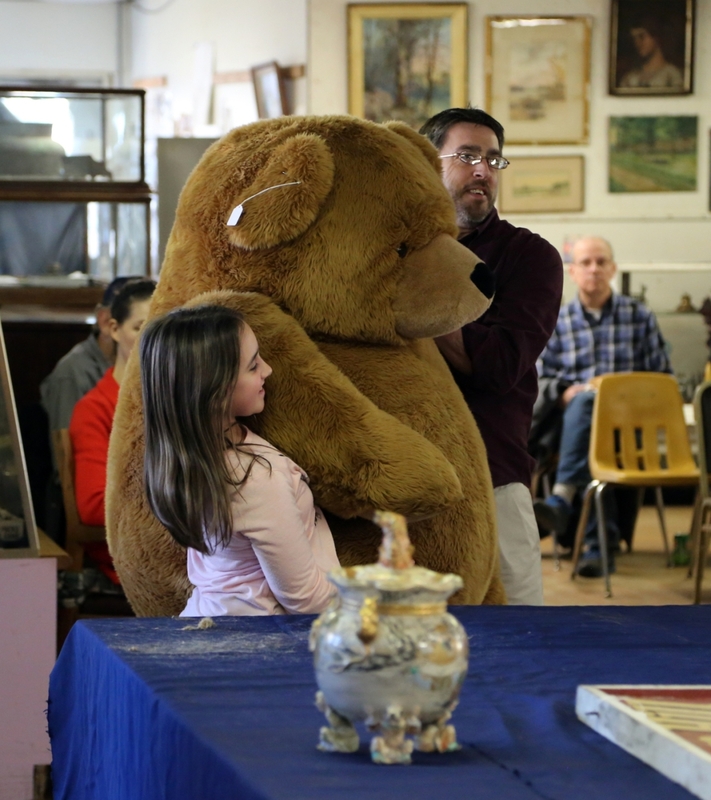 Ingraham has been doing New Year’s sales for 15 years now, and many of the buyers on hand have made the auction a tradition of their own. The stories were accompanied by Sonntag Jr’s original watercolor illustrations, something the artist would be known for a few years later. According to a biography published by the Mary Ran Gallery, Cincinnati, Ohio, Sonntag Jr attended classes at the National Academy of Design, where he exhibited his work in 1888, 1889 and 1890. He would later become a member of the American Water Color Society. The biography notes “Sonntag also made on-the-spot drawings of current news events for many of New York’s newspapers and magazines.” That act most closely describes the portfolio at hand. In 1898, Sonntag Jr died at the age of 29. 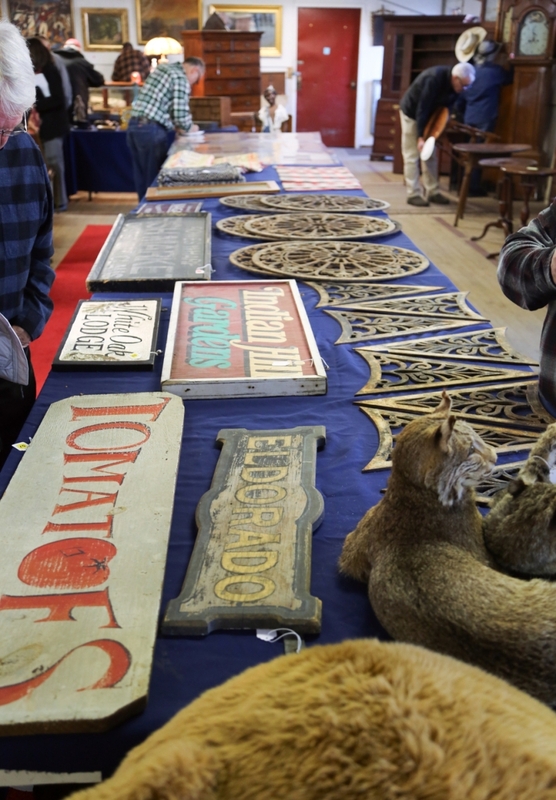 Signage for a variety of age-old businesses was sought after. 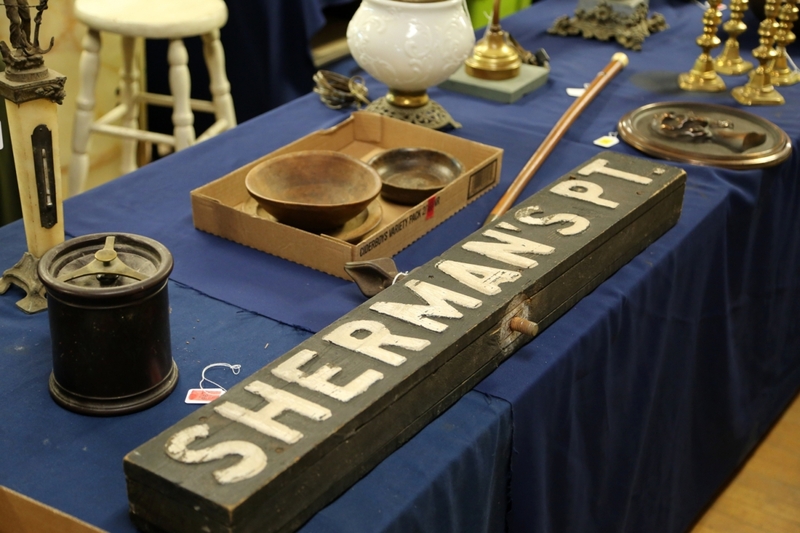 The category was led by a large Rowe’s Wharf Fish Market painted wood sign at $575 and was followed by a Sherman’s Point double-sided sign, $316; Until 2 pm, $258; a porcelain Niagara Insurance Company sign, $287; Tomatoes, $373; El Dorado, $86; and a cast iron bus stop sign, $374. 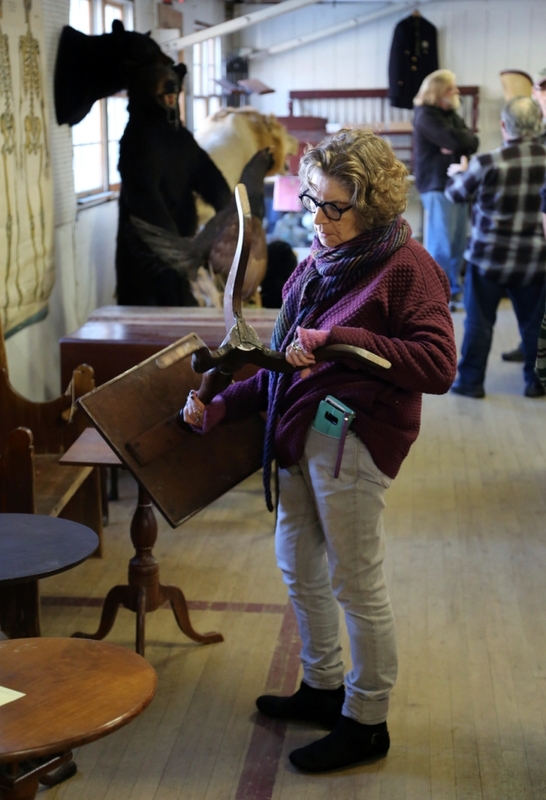 Raccoons, bears and hungry lions made up the taxidermy offerings in the sale. 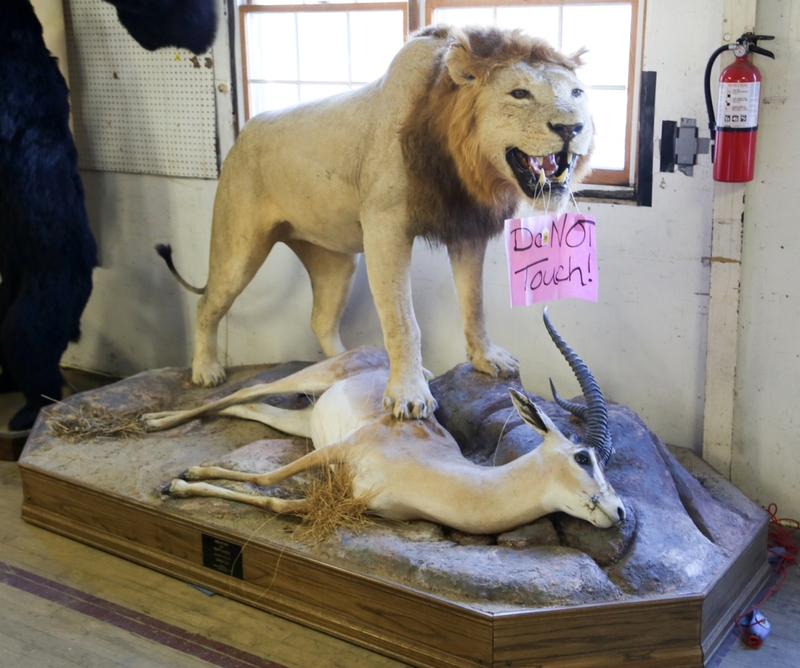 The latter, a fierce young male standing lion with one paw on a freshly killed gazelle, went out a $1,150. Formal and country-painted American furniture was spread throughout the sale. Ingraham noted solid bidder interest in this category in a follow-up call with Antiques and The Arts Weekly. 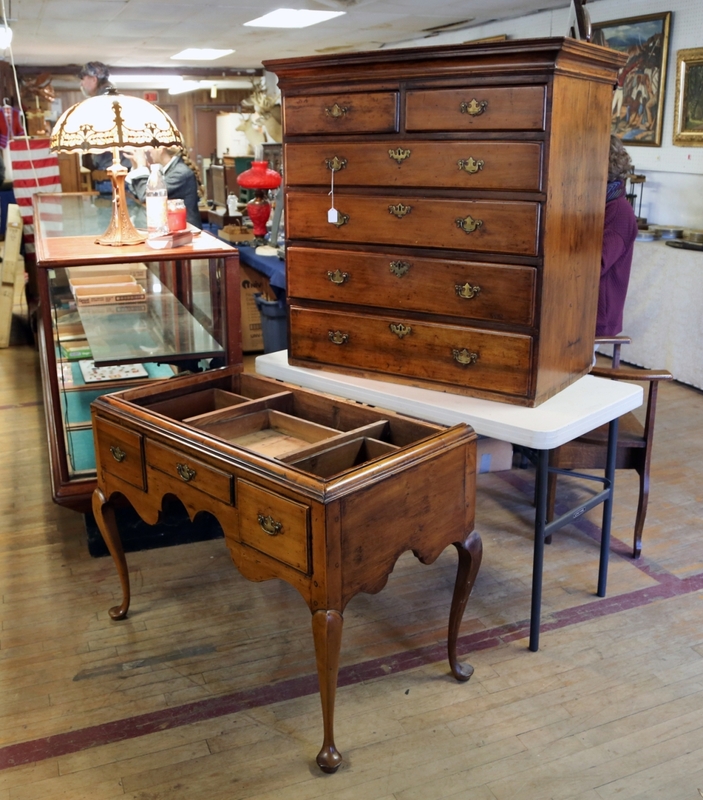 At the top was a Queen Anne maple highboy with original brass hardware that brought $1,092 to a floor bidder. 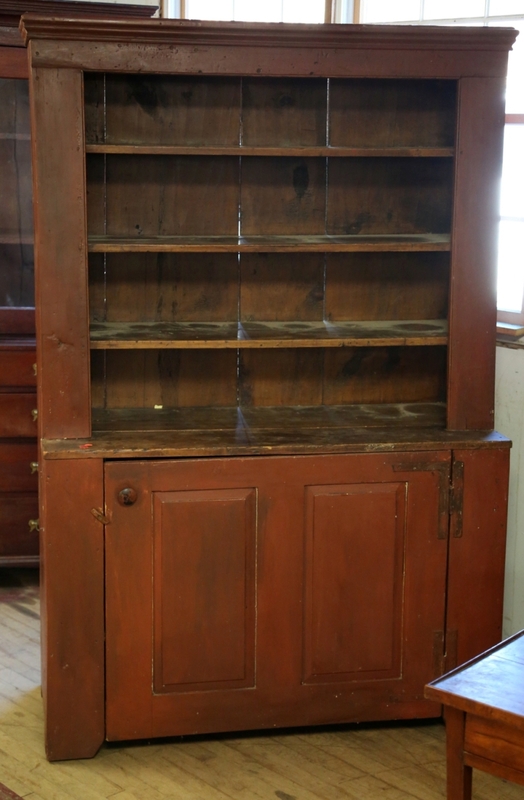 Also notable was a red-painted stepback cupboard, $603; a country-painted red slide door hanging cupboard, $259; a William and Mary table top chest of drawers, $201; a red pumpkin painted jelly cupboard, $373; and a bench table, $201. 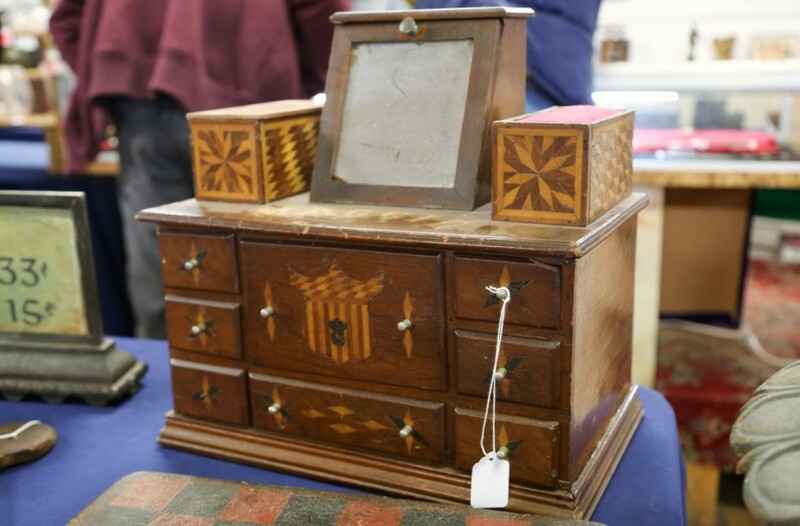 This nice little marquetry sewing box, complete with mirror and its original drawers, brought $604. 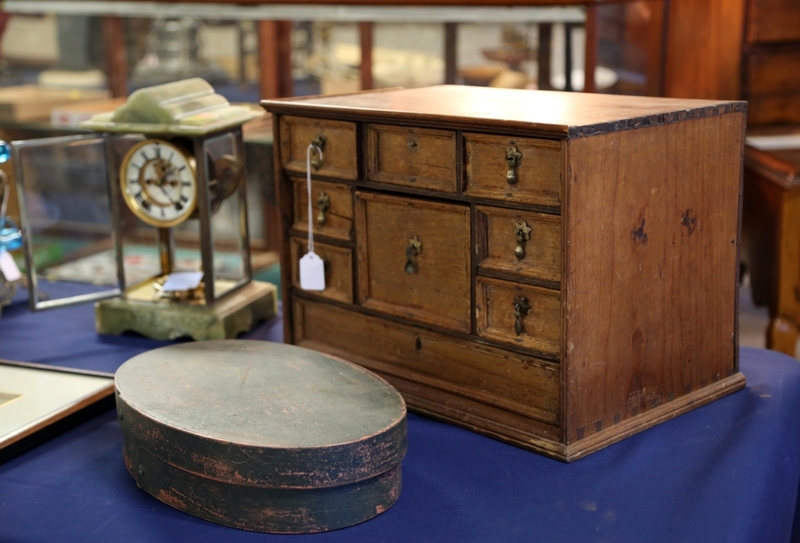 Bidders were not disappointed with the selection of Shaker boxes, treenware and primitives. All that were offered found new homes. In treenware, a large dough bowl went out at $288; another large bowl at $150; and a grouping of turned bowls and plate, $403. A fingered Shaker pantry box with lid sold at $345, and a small Shaker oval green-painted box with lid took $144. In objects, an early Twentieth Century folk art shooting star weathervane brought $115, and a barber pole took $259. 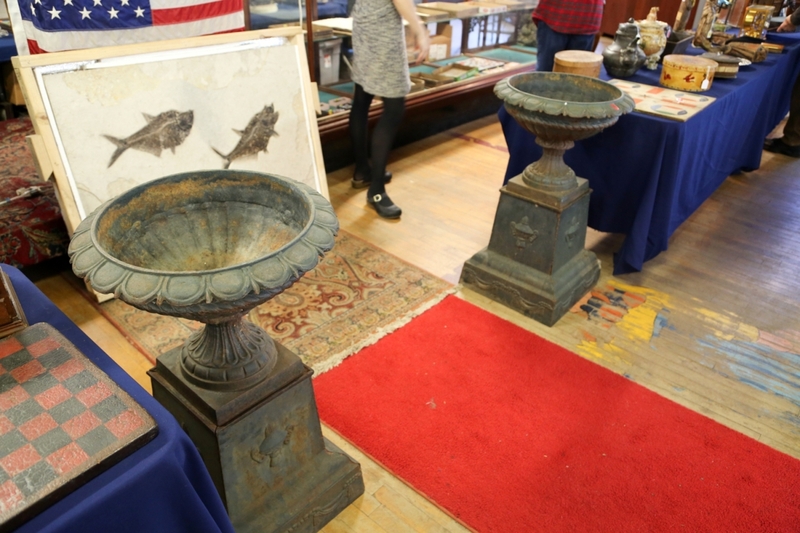 A red-painted country candle box sold for $259; a distressed, painted watch trade sign, $265; a Russian icon, $460; a set of iron appliques, $575; a pair of cast iron garden urns on stands, $518; a red- and black-painted checkerboard, $316; and a mounted flat stone featuring the cutaway of two fish fossils, $1,380. A $500 United States bill sold for $1,380, not because of alchemy, but rather rarity. American Arts and Crafts was represented in the form of two desks, two lamps and a pair of E.T. Hurley candelabras. One quartersawn oak desk was represented as L & J.G. Stickley, while the other was not. The buyer did not care, as they both brought $259. Two signed Miller slag glass lamps sold, one at $431 and the other at $345. 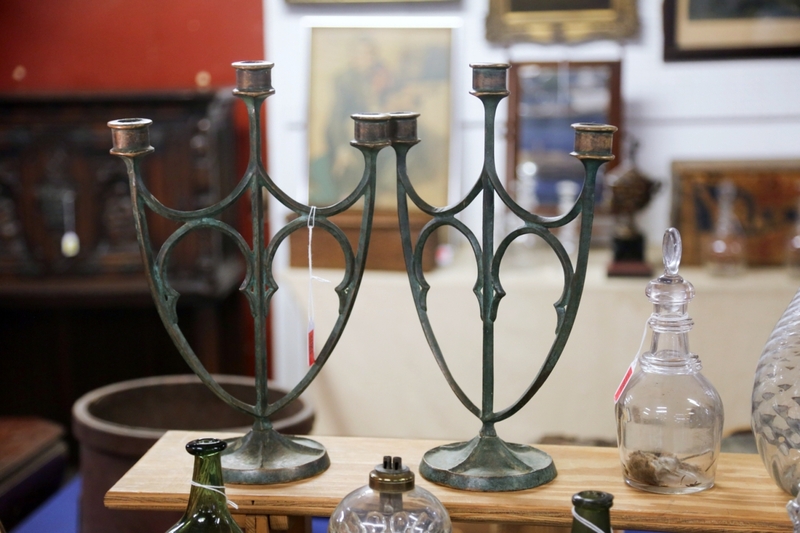 Finally, a pair of signed bronze candelabras from artist E.T. Hurley brought a good price at $632. A number of paintings were sold at the sale, and many were affordable. This included a signed Edward Moran nocturne seascape featuring a ship, which sold at $2,300 to a left bid. An oil portrait of Toussaint Louverture, the leader of the late Eighteenth Century Haitian revolution, brought $201. 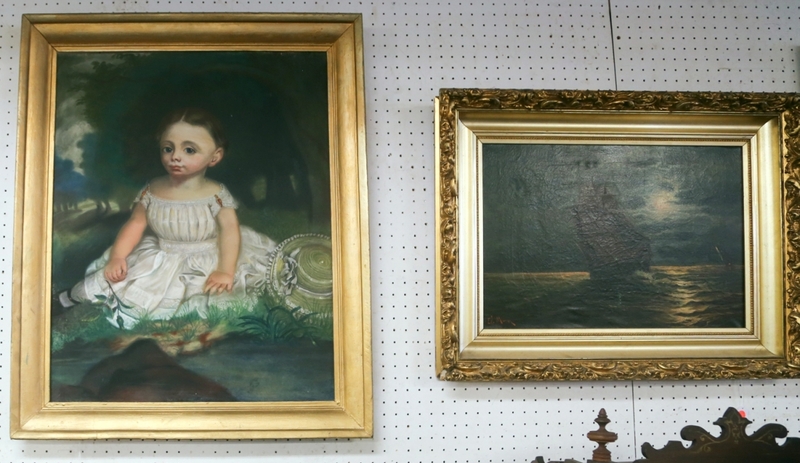 An oil portrait of a little girl sitting in the grass brought $345. A signed Edward Moran nocturne seascape painting featuring a ship went to a left bid for $2,300. The portrait of the little girl brought $345.